Well, that didn't take long. 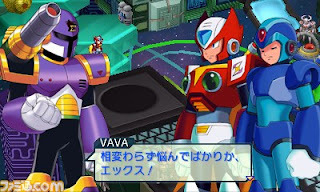 Following yesterday's Famitsu leak, a handful of Project X Zone screens have emerged which just so happen to include a very nice look at Vile in action. Ah, isn't it good to see him in sprite-form once again? So nice! Check out all the screenshots at Famitsu online. Thanks for the tip, all! He has a Rocket Punch, giant laser blast, and some kind of fire dash attack... and he's still evil. yay more pictures from a game that will never be released in english, anyway enough of the sarcasm. if there's ever a hack to make the 3ds region free I'd definately import this regardless of language barrier.